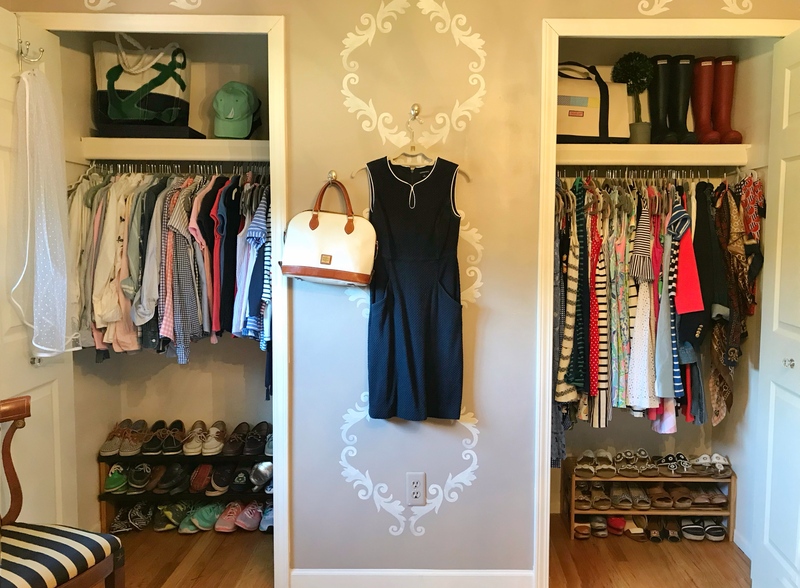 I like to keep a pretty organized closet because it helps me be able to find things easier and put together outfits in the mornings a little quicker. I don’t color-code items, mainly because I’d feel guilty about how many blue shirts I own, but I do organize them by clothing type. Right after Virginia was born I had a lot of time at home and did a little extra organizing in my “dressing room”. 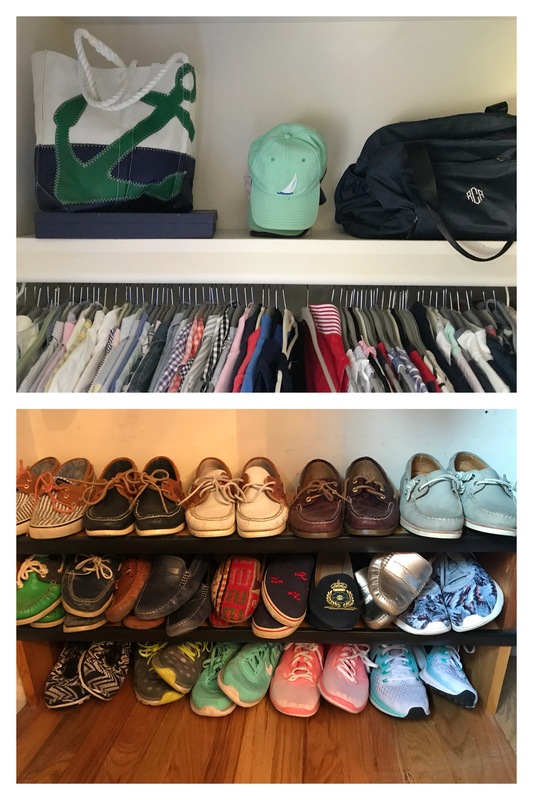 I was switching over my closet from fall/winter to spring/summer attire, and ran into a few space issues. The biggest resolution was buying velvet hangers and switching out all of my hangers completely. I really wish I would have done this sooner because everything lays flat and I can fit WAY more in my space. It also looks more uniform, whereas before I had a few different types of hangers and it looked messy. 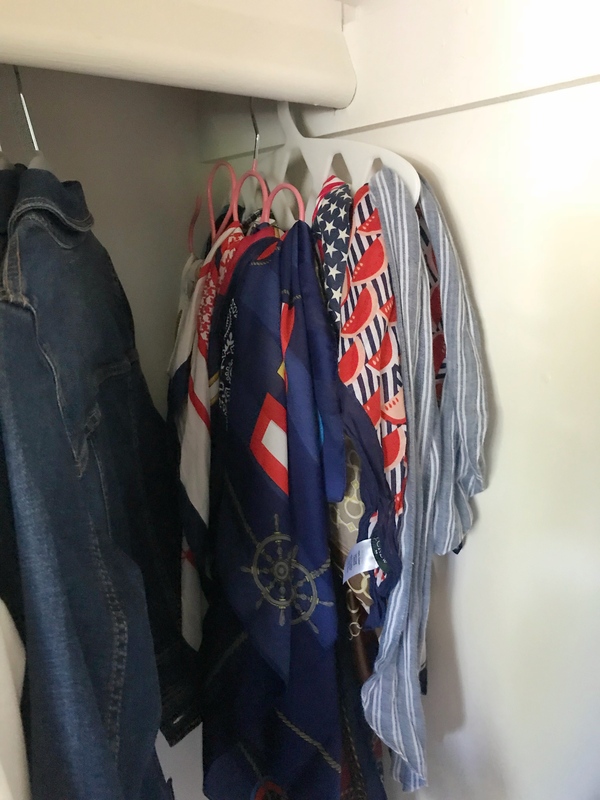 The photo above shows the right side of my closet. You can tell it goes in deep on the left part, and I show a little bit of that in the top right photo. I keep a bin there for little things that often get disorganized – such as make-up bags, sunglasses that I don’t wear as often, wallets that I’m not using at the moment, etc. The shoe organizer on this side is new. I have one my dad made me a long time ago on the other side, but I have many summer shoes that I couldn’t fit on the other rack. I did a lot of researching and found this shoe rack from the Container Store was the right size to fit my needs. This is another item I use to organize my many scarves. I find it’s easier to sort through them when they’re hung vertically. 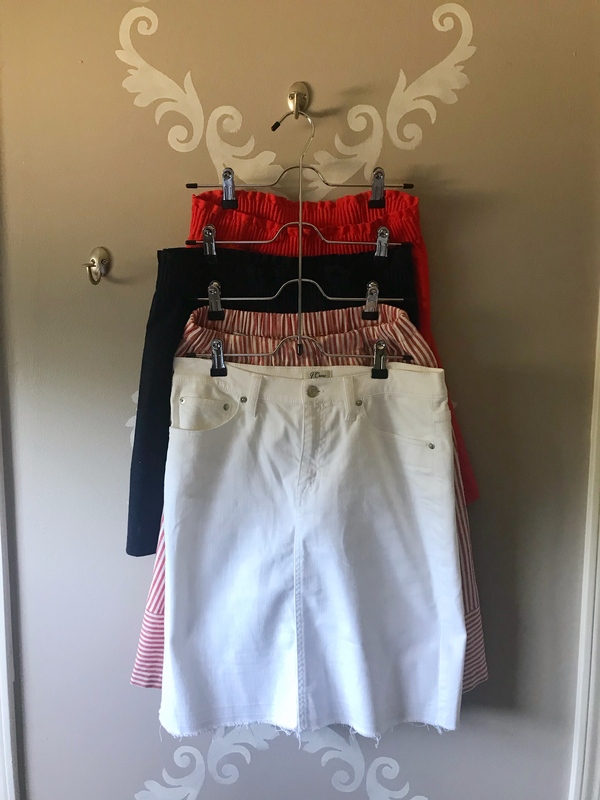 I found that skirts were taking up a lot of room in my closet because skirt hangers are a little clunkier and I didn’t seem to have many to begin with. I’d always try to fit two skirts on one hanger and it really wasn’t great for the garment itself. I found these skirt organizers in a three pack and I love them! It’s easy to see the skirts and opened up so much more space in my closet. Above you can see I like the decorate the top shelf while keeping functional. I keep smaller bags and totes in the large tote, and stack many in-season hats where they’re visible so I won’t forget about them. My gym bag also fits perfectly on this shelf! Below is the shoe rack my dad made me, and so I was happy to find the one from the container store because it’s a similar size. 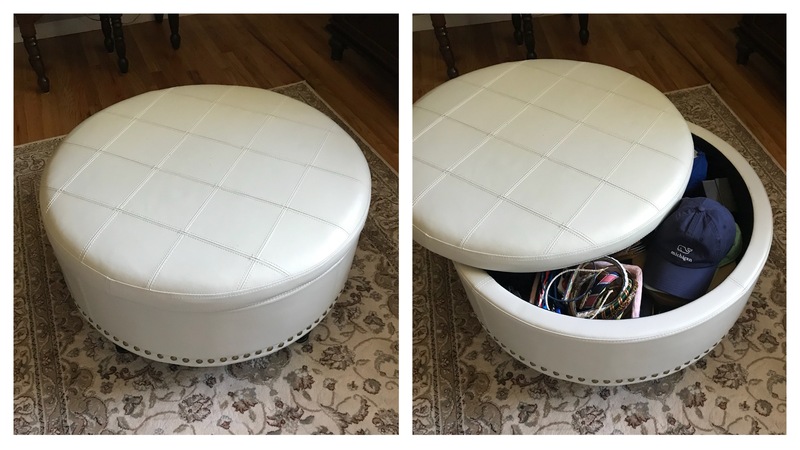 This storage ottoman (I like this version too) is my favorite way to sneak in some storage and it’s extremely functional as well. I keep hats, headbands, some of my fancier shoes that I barely wear, as well as iphone cases that I’m not using. It’s a great way to add seating and storage to my space. 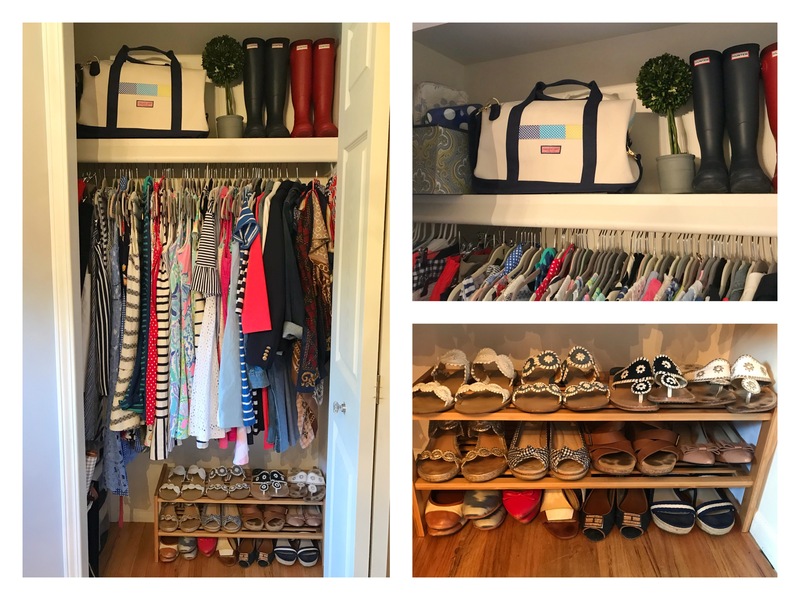 So that’s my closet and the recent organizational items I’ve been loving. 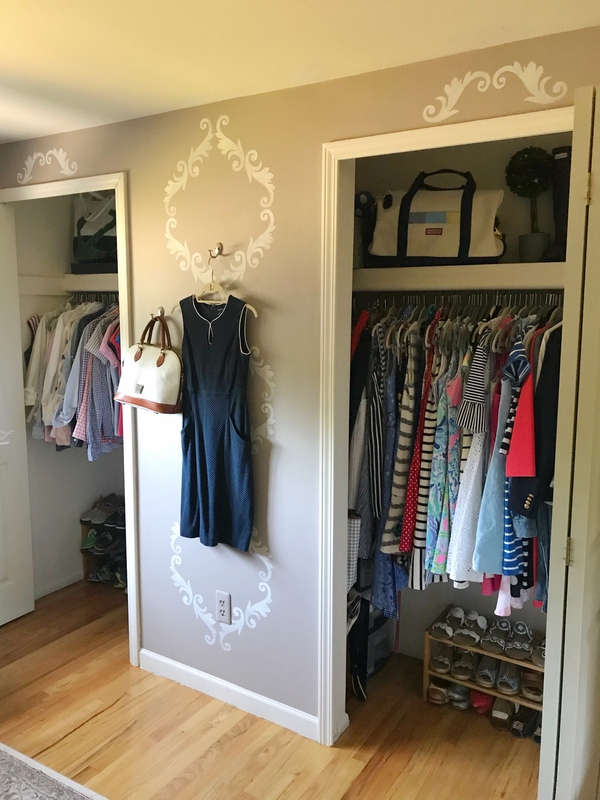 If you love organizing your closet and can think of an item that I’d find useful, please don’t hesitate to comment below! This looks great! 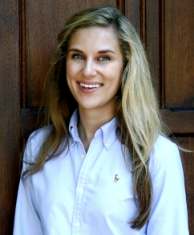 I’m the same way about color coding my clothes…it would all be navy! I think you did a good job of making it decorative, but still practical and functional! Blue is the best color that’s why! Yes I love them! Not sure if you have TJ Maxx there but that’s where I found them.